Version 1.6.2 is the first major Manga Studio 5/Clip Studio Paint patch to come out since last year and it’s a big one! You can read the full patchnotes and features here. The most prominent change is the introduction of Clip Studio Assets and the Clip Studio launcher application. Previous to this patch, accessing Japanese CSP assets involved downloading the Japanese client, downloading assets and searching around to export them (Basically, a gigantic pain.) 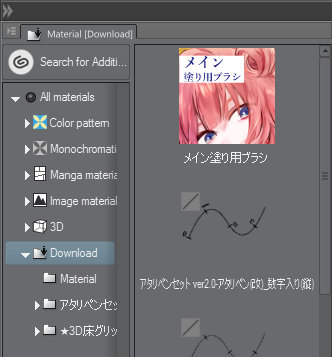 Now, you can download them easily inside of the new Clip Studio App. While the contents are in Japanese, most of the tools are self-explanatory and often come with mini-tutorials. After you download new assets, you can find them in the Material Tab. At the bottom of the list, there is a new Download folder. From there, drag and drop tools onto the toolbar so they’re easily accessible. If you were holding off of Clip Studio Paint because your workflow involves the use of Color layers, the functionality is finally available in the program. Additionally, if you’re used to Photoshop brush engine, you probably noticed that Clip Studio Paint lacked the ability to adjust opacity via pen pressure. That has finally been remedied as well. Impressions: A couple hours in. Overall, performance is roughly the same. 3D objects move a little better, but adjusting their joints still feels stiff and janky on my setup. However, nothing feels especially broken or different than the previous version.